Italian physician; born at Triest Aug. 9, 1840; died at Florence March 10, 1886. After graduating from the University of Padua (1862) he became assistant at the General Hospital in Venice. In 1868 he was one of the founders of the maritime hospital for scrofulous children at the Lido of Venice, at which institution he was physician-in-chief till 1873; he then removed to Padua, where he became privat-docent at the university and practised medicine, treating especially the diseases of children. In 1878 he was appointed chief departmental physician at the General Hospital at Venice, lecturing there upon pediatrics. This position he resigned on account of illness in 1881, and then left Venice. In 1884 he was appointed professor of pediatrics at the University of Florence. 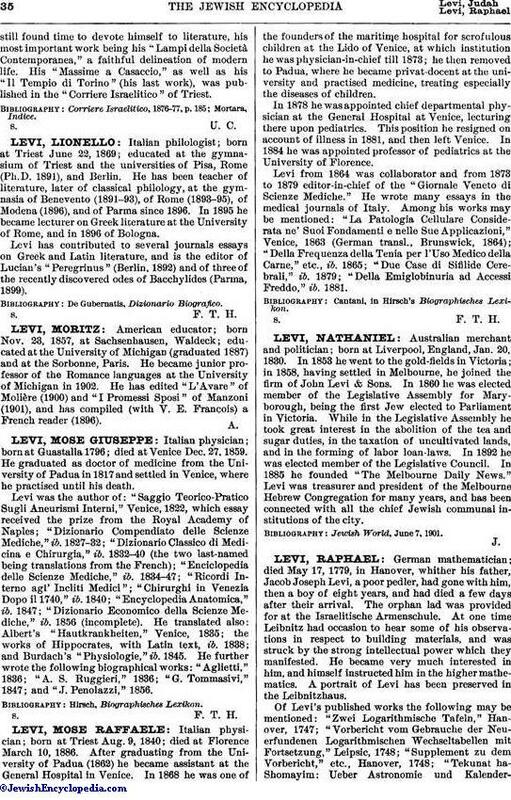 Levi from 1864 was collaborator and from 1873 to 1879 editor-in-chief of the "Giornale Veneto di Scienze Mediche." He wrote many essays in the medical journals of Italy. Among his works may be mentioned: "La Patologia Cellulare Considerata ne' Suoi Fondamenti e nelle Sue Applicazioni," Venice, 1863 (German transl., Brunswick, 1864); "Della Frequenza della Tenia per l'Uso Medico della Carne," etc., ib. 1865; "Due Case di Sifilide Cerebrali," ib. 1879; "Della Emiglobinuria ad Accessi Freddo," ib. 1881. Cantani, in Hirsch's Biographisches Lexikon.